The CE marking is an administrative sign which, according to EU Regulation 765/2008, states that “the product meets the applicable requirements laid down in the Community harmonization legislation on its installation”. 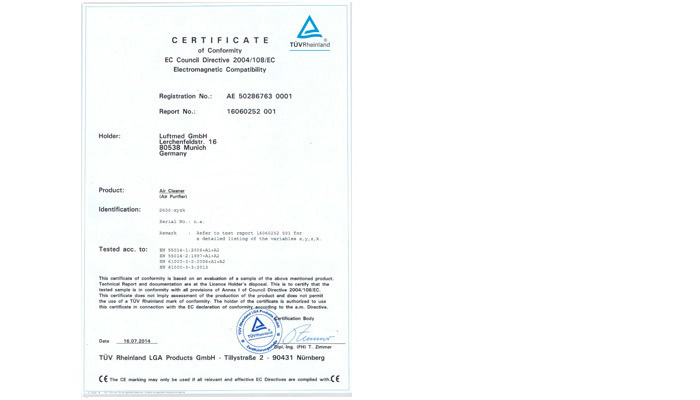 The GS symbol is a legally-regulated test mark in Europe for product safety. This means that awarded products certify that it complies with the requirements of § 21 of the Product Safety Act (ProdSG) and meets certain DIN and European norms. 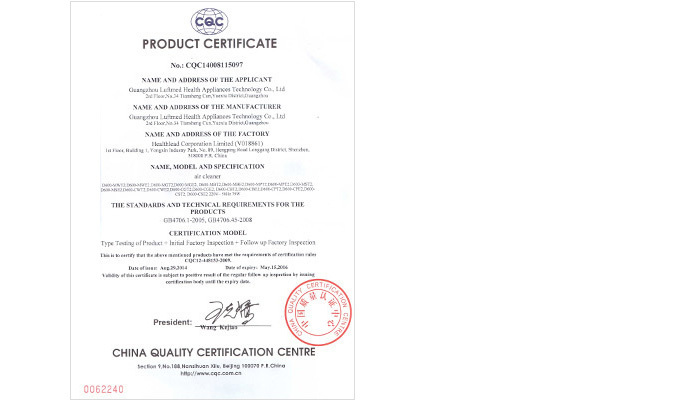 The China Quality Certification Center (CQC) is the largest professional certification body in China and specializes in product certification with the China Compulsory Certification (CCC). 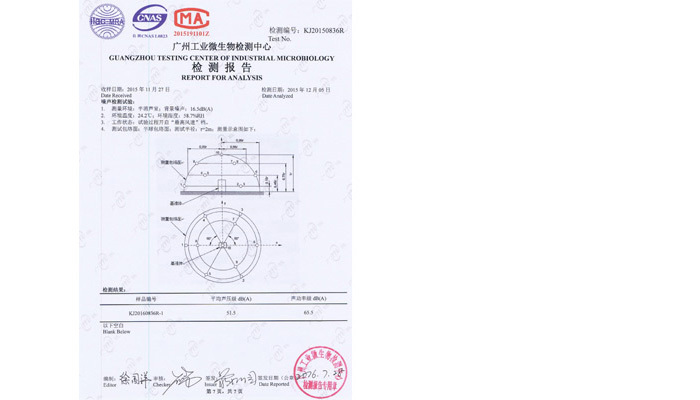 In addition to perfomance, quality tests are also carried out by air purifiers. TÜV Rheinland (China) Ltd is part of the worldwide TÜV Rheinland Company and one of the market leaders in the field of quality testing and product certification. 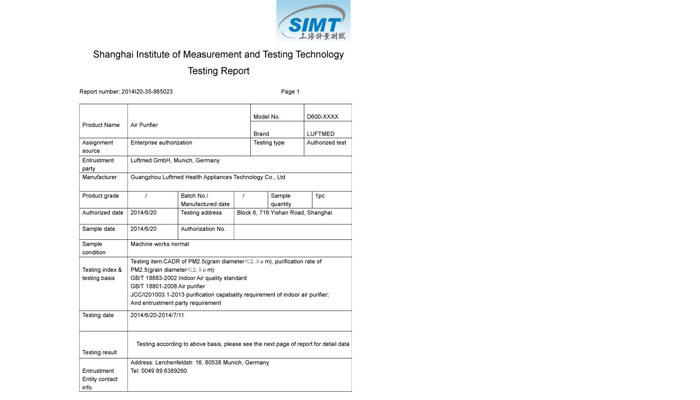 The Shanghai Institute of Measurement and Testing Technology (SIMT) is one of the first internationally established and professional measurement and testing agencies in China. The institute performs performance tests in the field of air cleaners, divided into categories of harmful substances. The GB standard (GB is short for Guobiao: “National Standard“) is the basis of the CCC (China Compulsory Certificate) product under the CCC certification. 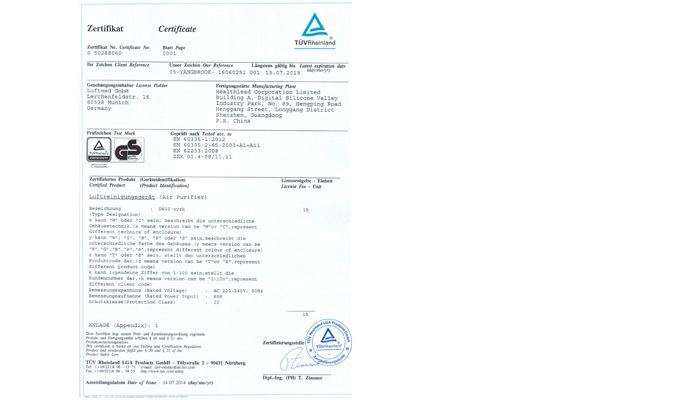 SIMT Certificate: categorised performance-tests for Benzene (No. 2014I20-35-885547), CADR&DBDR (No. 2014I20-53-881516), Formalin (No. 2014I20-35-885546), Ozone (No. 2014I20-53-881475), PM2.5 (No. 2014I20-35-885023), Sanitation/Safety (No. 2014I20-53-881476) and TVOC (No. 2014I20-35-885548).